Heart healthy cooking tips for your family. This webpage will bring you healthy cooking tips to ensure the long lives and health of our families. But did you know that almost any recipe can be converted to become more heart healthy. By reducing the fat, sodium, and calories in what we cook, we can guarantee a good healthy diet for ourselves and our families, I used a book written by Evelyn Tribole, titled Healthy Homestyle Cooking, as a reference for this webpage. 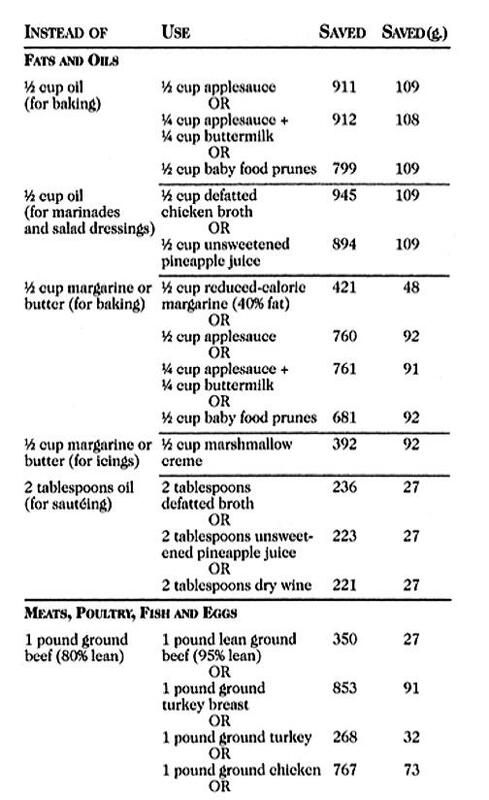 There are three basic methods to reduce the amount of fat and calories in a recipe. *Reduce the amount of a high fat ingredient, or eliminate it altogether. *Use a reduced fat cooking technique or method. Remember, when you are modifying a recipe only make one modification at a time. For example rather than changing an ingredient and a cooking method at the same time, change only the ingredient. If that works well, then the next time you prepare the dish, change the cooking method. Experiment, see which works for you. Do not be afraid to try new things. One of the best healthy cooking tips is not to announce the merits of your new creation, let your eaters tell you what they think. You may even get asked for the recipe! 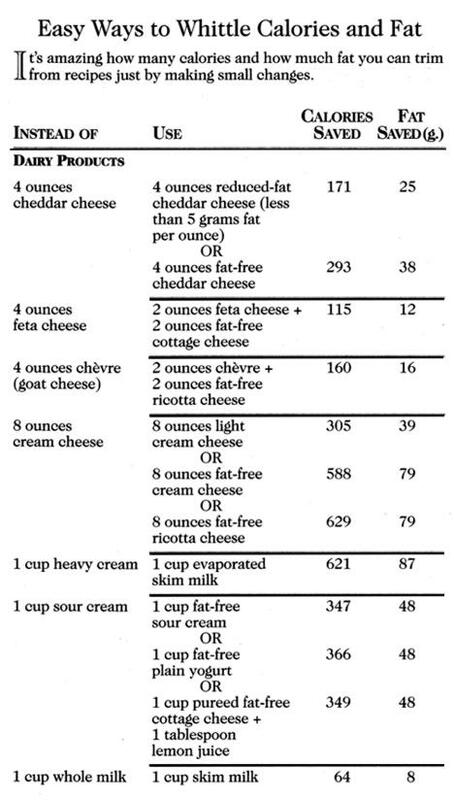 The easiest way to reduce the amount of fat in a recipe is to use a low fat version of an ingredient. Today you can choose from a great variety of reduced fat and fat free cheeses, dairy products, salad dressings, canned soups, pasta sauces, and much more. Reducing the fat in a recipe goes beyond using leaner ingredients, it also means using healthy cooking tips and techniques. 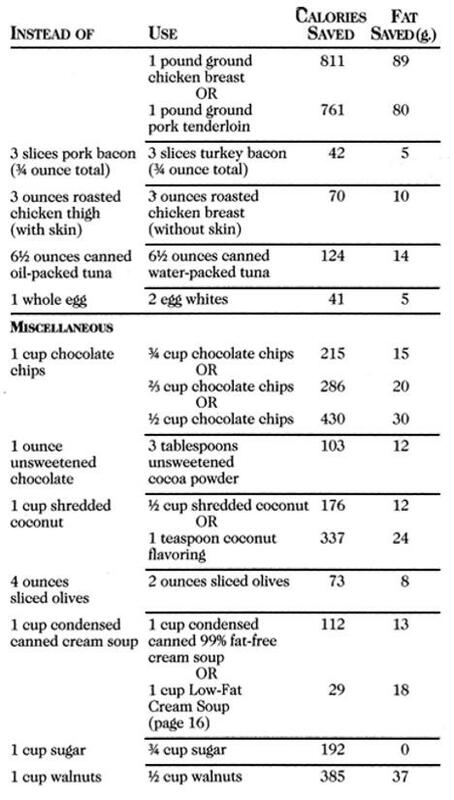 Below are a variety of ways that you can reduce the fat and calories in your recipes. * Steaming, poaching, grilling, broiling, baking, and roasting are great alternatives to frying. * Replace 1/4 to 1/2 of ground meat in casseroles or meatloaf with cooked brown rice, couscous, or cooked dried beans. This not only stretches your meat budget, it adds fiber that meat lacks. * Skim and discard fat from broths or soups before serving. You may have to chill it first then skim the fat. * Trim all visible fat from meats before preparing them. * Remove skin from poultry before cooking. Substitute chicken breast for dark meat when possible. * Cut the fat where you won't miss it. But keep the characteristic flavor, by reducing the amount of nuts, coconut, chocolate chips, and bacon by 25-50%. For example if a recipe calls for 1 cup of walnuts, use 1/2 cup. You will reduce you calories by 375 and the fat by 37 grams. * Use powdered sugar on a cake instead of frosting. * Increase fiber content and nutritional value of dishes by adding whole wheat flour for at least 1/2 of the all purpose white flour. For cakes and cookies you can get whole wheat pastry flour at some health food stores or some well stocked grocery stores. * If sugar is the primary sweetener in a fruit sauce, beverage, or other dish that isn't a baked good, scale the amount down by 25%. For example instead of using 1 cup of sugar use 3/4 cup. * Toast nuts to enhance their flavor and finely chop them so that they are more evenly distributed throughout a baked product. * Use pureed cooked vegetables like carrots, potatoes, or cauliflower, to thicken soups and sauces instead of cream or a flour roux. * Use healthier fats such as olive oil, canola oil, or sunflower oil that are low in saturated fats. As you make your recipes into healthier versions,and begin to use these healthy cooking tips, remember it is progress, not perfection that counts. Sometimes you won't be able to replace every fatty ingredient, or change a cooking method without compromising the quality of the dish, Even making one change in a recipe is a step in the right direction. Look at the charts below for some more helpful hints. Back to "Healthy Diet" from healthy cooking tips.